One Saturday, I went downstairs and there was water on the floor over by the hot water heater. I thought rain had leaked in there or something but it wasn't; it was the hot water heater. It had finally given up and sprung a leak. It was almost twenty years old. 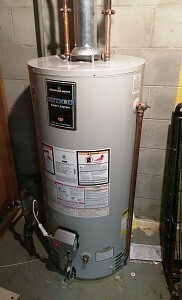 So I needed a new hot water heater ... on a weekend! I contacted you guys (editor's note: Networx) online at first and no sooner did I punch ENTER than I got a call from Fast Response Plumbing. I mean, it was just as fast as that. And they gave me a price which was reasonable considering that I needed a lot of work to be done there. And I said, "Well, when can you come?" thinking they'd say, "Oh it'll be next Monday or Tuesday." And she says, "Well, he'll be there in an hour." And he was. The gentleman that came was really good. I didn't realize he was going to come on a Saturday; I thought I was going to have to wait. His plumbing outfit is based in Glassboro, which is about a 20-minute drive. He also went and got the heater, all part of the deal. 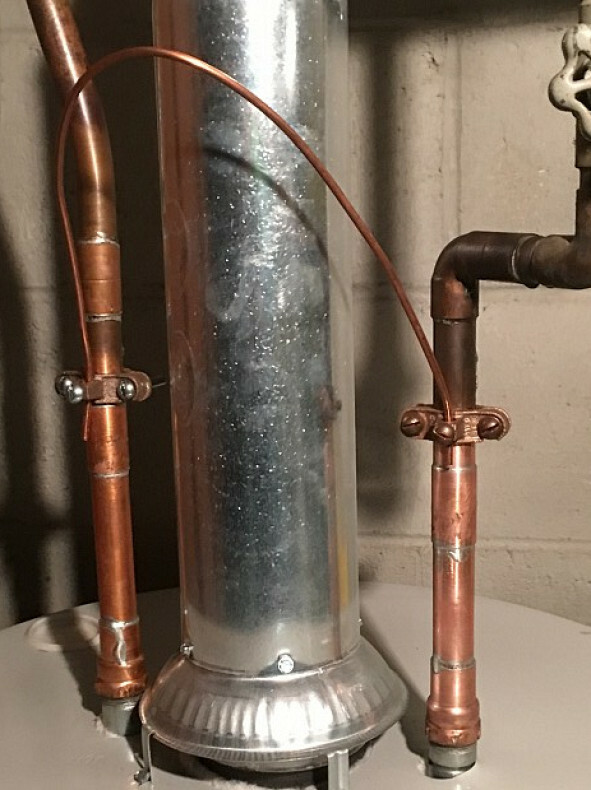 The water heater he put in had the same capacity but it was bigger around than the old one because of more insulation they put in them now. Where my basement stairs come down, they end at a wall and it's a narrow turn. He had a terrible time, trying to get that thing turned around down there, but he wouldn't let me help. He said, "Oh no, I'm not allowed to let you help." So he had to do it by himself. Getting the old heater out wasn't that big a deal 'cause it's smaller in diameter. But then, back when they put it in, they used a 3" diameter vent pipe and the new rules say it has to be 4". So no big deal, just pull out the old vent pipe. 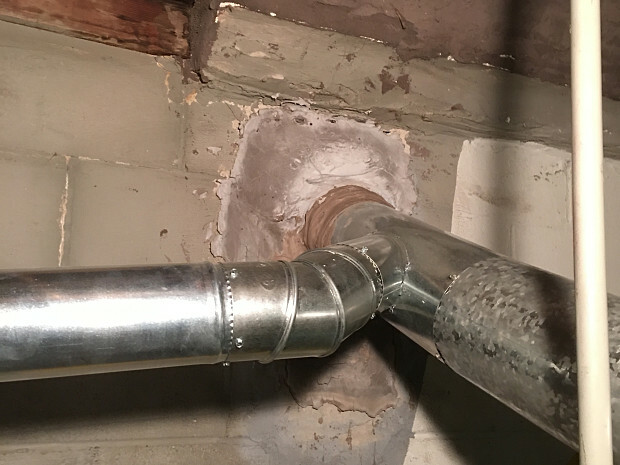 Well, whoever had installed the old vent pipe back all those years ago, instead of using cement, they apparently used something with epoxy, because the new fellow had to use a mallet and a chisel to dig it out. The stuff he had to chisel out of the wall to get the new pipe up -- he cleaned up everything. So he earned every bit of his fee. I mean, he really worked hard. He was done by about 4 o'clock in the afternoon. I'm happy with it. If anything I've got to turn it down a little because oohhh! It's hot. But it doesn't run that much ... I guess because of all the insulation on this new one. So it works very well. It even has a little green light computerized thing on it. When I go downstairs, I look over in that corner, even if the overhead light's off down there. If the green light is flashing, everything's working good. He had about 3 or 4 toolboxes downstairs that he was using, with his tools and the pipe and the connectors and all that. And when he was done I said, "Let me help you. Let me carry some of those up for you. " And he says, "Oh no no no." I told him, "Look ... just turn your back. I'm going to carry some of those up for you." I felt bad for him, you know, having to go up and down all those stairs 3 or 4 times. I have a hard enough time doing it myself. 'Course I'm a little older than he was. I've already recommended him to a friend of mine who needs a hot water heater replaced. I hope they call him. I have his card, because I'm going to call him if I need him again for anything. I would definitely use him again. I have a plumber here in town that I've used ... oh ... since I first moved in here. He used to be my regular plumber, you know, like you have a regular doctor. When I went to call him on Saturday, though, they'd gone to a Monday-through-Friday operation and they charge a LOT extra to come out on a weekend. So that's why I went looking for someplace else. I couldn't believe how fast the new guys responded. I figured, "Boy! This is a good sign." They sure live up to their name. Fast Response Plumbing, LLC John Sielke: Unbelievably fast response, on a Saturday. I will use them again! Kitchen Faucet Replacement with a Unique New Feature by Ronald P.
Beware Of Bad Contractors! Take My Advice To Protect Yourself by Shanna C.